Uncooked amaranth grain is 12% water, 65% carbohydrates (including 7% dietary fiber), 14% protein, and 7% fat (table). A 100 grams (3.5 oz) reference amount of uncooked amaranth grain provides 371 calories, and is a rich source (20% or more of the Daily Value, DV) of protein, dietary fiber, pantothenic acid, vitamin B6, folate, and several dietary minerals (table). Uncooked amaranth is particularly rich in manganese (159% DV), phosphorus (80% DV), magnesium (70% DV), iron (59% DV), and selenium (34% DV). Cooking decreases its nutritional value substantially across all nutrients, with only dietary minerals remaining at moderate levels. Cooked amaranth leaves are a rich source of vitamin A, vitamin C, calcium, and manganese, with moderate levels of folate, iron, magnesium, and potassium. 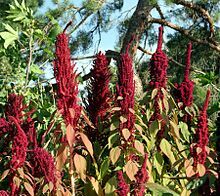 Amaranth does not contain gluten. Amaranth grain contains phytochemicals that are not defined as nutrients and may be antinutrient factors, such as polyphenols, saponins, tannins, and oxalates. These compounds are reduced in content and antinutrient effect by cooking. ^ "Amaranth grain, cooked, per 100 g". Nutritiondata.com, Conde Nast; from the USDA National Nutrient Database, SR-21. 2018. Retrieved 20 April 2019. 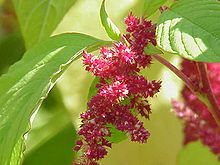 ^ "Amaranth leaves, cooked, boiled, drained, without salt, per 100 g". Nutritiondata.com, Conde Nast; from the USDA National Nutrient Database, SR-21. 2018. Retrieved 20 April 2019. This page was last edited on 20 April 2019, at 19:41 (UTC).